Disclaimer: I received an entry for Illinois Marathon to review as part of being a BibRave Pro. Learn more about becoming a BibRave Pro (ambassador), and check out BibRave.com to review find and write race reviews! As you might have read, I am registered for the Full I-Challenge at Illinois Marathon weekend April 21–22. That means the 5k on Friday night and the full marathon on Saturday morning. You can read a bit more about why I chose the race here if you like. "The Campus Sportswear team is rolling on designs and screen printing our 2017 race shirts. They have begun printing thePresence Health 5K Run/Walk shirts. Our designs this year will celebrate the Sesquicentennial Celebration of the University of Illinois. This shirt features Red Grange’s “Galloping Ghost” statue, located on the west exit of Memorial Stadium. The 5K Shirt is printed on an Alo Sport Unisex 100% Polyester Shirt in Sport Royal." 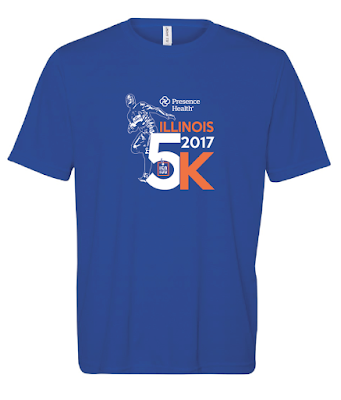 Illinois Marathon is hosting a fun New Year's Day 2017 Resolution Registration Sale. You can register and save $5 with code 'bibravebonus' (does not include Youth Run, but for any other race - 5k, 10k, half marathon, full marathon, marathon relay, or the I-Challenge (5k + 10k, half marathon, marathon relay, or marathon). On Sunday, January 1, 2017, use code bibravebonus at the end of the registration process to receive a $5.00 discount on the entry and you'll automatically be entered into the drawing for the prize above. The discount is valid until registration closes, however, to be entered into the drawing, you must register on January 1. Hope to see you there! I wish I was able to register that day - awesome prize package! You guys know I love to buy all the gear at the marathon expos haha.